Michigan Saving and More and Craved Raves. 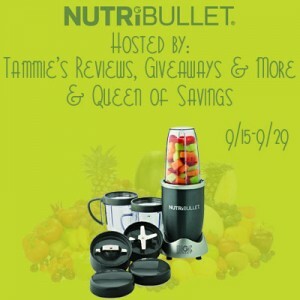 You can read Tammie’s review of the NutriBullet by going HERE to read it. Everyone I know loves making a smoothie and all sorts of healthy drinks but that is just about to get easier as the NutriBullet is a must have product to do it easier, make it easier and drink it easier. This sweepstakes will end on 9/29 at 7 p.m. est. Disclosure- Finger Click Saver was not compensated either by free product or payment. FCS has not been compensated for this post. All opinions and experiences are my own. Open to the US, must be 18+. Confirmed Winner(s) will be contacted by email and have 24 hours to respond before a new winner will be drawn. No purchase necessary. Void where prohibited by law. Entrants must only enter with either one email address, IP address and/or Facebook account, anyone found violating these rules will be disqualified. It is at the sole discretion of the admin of the giveaway if the winner has met the rules or not. The sponsor(s) will be responsible for product shipment to winner(s) of the giveaway. Sponsor will be responsible for prize fulfillment. This event is in no way associated with, sponsored, administered, or endorsed by Facebook, Twitter, Google, Pinterest or any other social media network. The disclosure is done in accordance with the Federal Trade Commission 10 CFR, Part 255 Guides Concerning the use of Endorsements and Testimonials in Advertising. For questions about this giveaway or to have me promote your product, Please email Tammie at info@tpankuch.com. I’d make smoothies.. I love smoothies! THanks! I make smoothies and soups in a blender. i would make a yogurt mango smoothie. I use blenders mainly for smoothies and sauces and dips. If I was to win I would love to make a peanut butter smoothie first thanks for the chance. FREE sample of Nesquik from Nestle Little Passports Fundraising For Your School!